A lot of my blog posts are Post-Its for my own brain. So is this one. I've managed to accidentally drag my Applications folder to the trash twice now and both times I had to wade through a half dozen non-optimal solutions on the web to find the one that actually restored it to what I had before. In OSX 10.6 it's actually pretty easy, if not very intuitive. Open Finder and select Macintosh HD. Then right-click on Applications in the second column and select Get Info. That will give you a popup like this. 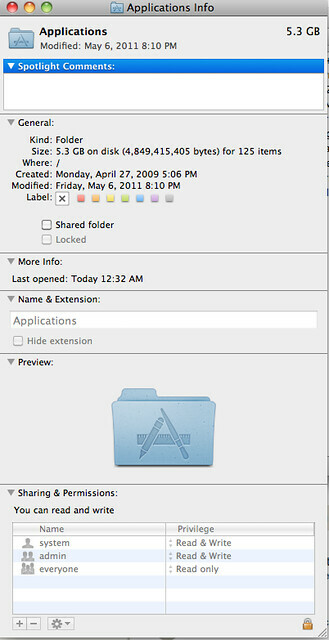 Under Preview, you'll see a folder with an "A" on it. Click and drag it just to the right of your Dock. Because it's a folder OSX won't let you actually place it in the Dock. Then right click on the folder to set how you would like it displayed, i.e. List, Grid, etc.